Just like good food habits, good money habits from the start can ensure that you effectively meet your financial Goals. Let's talk about two good financial habits that you can inculcate with Mutual Funds. 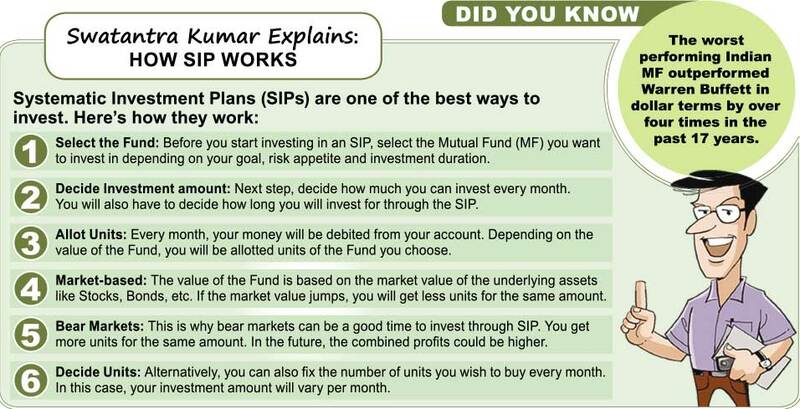 What does it do - Allows you to invest in a Mutual Fund scheme of your choice periodically in small amounts? Advantages - Cost averaging and compounding. Cost averaging means, you buy more units when markets are low and lesser units when markets are high. That averages your purchase cost and also protects against volatility. Compounding means, the returns from your investment are re-invested in the principal amount of investment. Thus the longer you remain invested in a SIP, the more you stand to gain. You can tie each SIP you invest in a separate financial Goal. You can begin with an investment of as low as Rs.500 and use the top-up facility of SIPs to increase your investments as your salary or cash flow increases. Investing in MFs through the SIP facility is akin to making an EMI payment but towards the Goal of wealth creation. By linking each SIP to a separate financial Goal, you can ensure that you can meet all your financial Goals promptly. What does it do - Allows you to withdraw a fixed amount from your existing investment by selling some units? In effect, it's an opposite of a SIP. Advantages - Cost averaging and Tax benefits. Cost averaging: The same principle of cost averaging is applicable in the SWP context as well. Tax efficiency: Any gain on the sale of MF units attracts Short Term Capital Gains Tax (STCG) of 15%. However, the sale of SWP are in smaller units from the principal amount and thus does not attract STCG. An SWP is an effective way of earning a fixed income at regular intervals from your existing investments in Mutual Funds. An SWP is especially helpful for a retiree looking to supplement pension income.